8 What Is The Best Car Gun Safe? 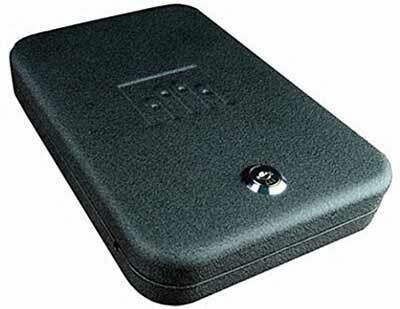 There are a lot of compact gun safes on the market, but not all of them are practical to use in your vehicle. The best car gun safe will have that compact design, but will be especially slim to give you options in where to place it. Too many so called car gun safes leave you with only the option to mount it in your trunk and requiring you to drill holes in place to mount it securely. 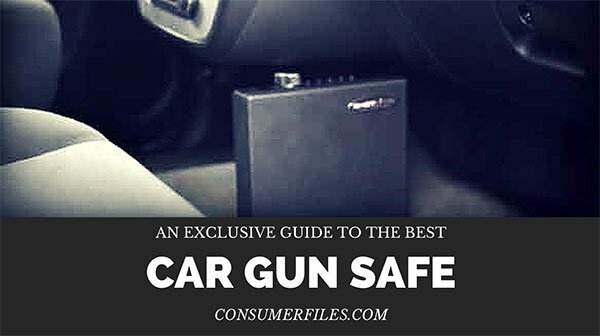 To help you find the best car gun safe, we put together a list of slim designed safes that can be either mounted permanently to a surface within your vehicle, or secured via a steel security cable. 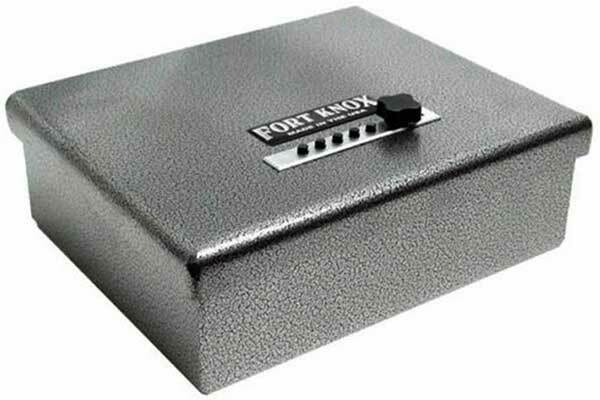 Our top pick is the Original Pistol Safe by Fort Knox. Keep reading to see if you agree with us. In the world of car gun safes, the PB1 Original Pistol Safe Box is a beast. 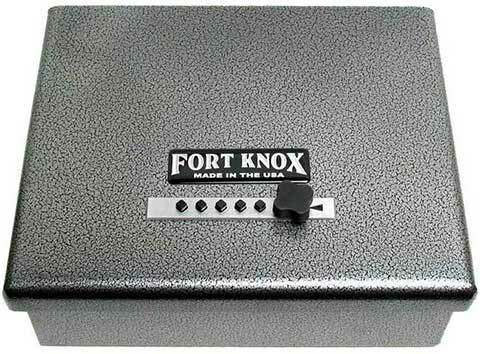 While other safes are made of flimsy steel and have plastic components in their locks -making them easily broken into with just a screwdriver- Fort Knox chose to make a safe that will actually keep your gun safe. This gun safe is made of heavy duty 10-gauge steel and features a wrap-around lid that’s an impressive 3/16 of an inch thick. This makes this gun safe for vehicles difficult, if not impossible, to pry open. Plus, it doesn’t have an electronic lock that can leave you scrambling to find the keys because the batteries ran dead or the electronics are faulty. It has a mechanical push button lock that relies upon a 5-digit code -giving you 1,081 possible combinations- and the turn of a knob to unlock. The inside features a thick layer of egg carton foam along the top and bottom. Gas-struts make it easy to open, and it has four pre-drilled holes that allow you to mount this safe inside your trunk or to the floor of your vehicle. That is one of the only drawbacks about this safe: it must be permanently mounted. It’s also a little on the large size, with external measurements of 4 ¼ inches high by 12 ½ inches wide by 10 3/8 inches deep and a weight of 22 pounds, which does limit where you can mount it. However, that is a small inconvenience when compared to the comfort of knowing that your pistol and valuables will be safely waiting for you in your car when you get back. This means that this vehicle gun safe will easily hold a Glock 19 (which it was designed around) or any smaller sized handgun. The security cable is thick -you can’t cut through it with scissors or even wire cutters. It’s made of 16-gauge steel with a black powder coat that makes it nonreflective and discreet, as it blends effortlessly with the shadows beneath the driver’s seat. The locking latch passes through three separate layers of steel to afford you extra security against possible break in. The inside is entirely lined with foam to protect your gun from getting scratched or dinged up, however, the foam isn’t so thick as to keep the gun from rattling about inside. This gun safe is also made in the USA and that quality is evident in every last detail. This car gun safe bears a similar appearance to a few popular gun safes by other manufacturers, however, it’s made with heavier construction that simply provides better security. It’s made of 16-gauge steel and has a simple tubular style key lock; it comes with two keys. As it is a Liberty, you can be sure that the lock is constructed using only quality materials -no plastic components that can easily be broken by inserting a screwdriver. It comes with a security cable with tight crimping at both ends, however, it does have pre-drilled holes in the bottom so that it can be permanently mounted to further prevent smash and grab. It measures 2 ½ inches high by 10 4/5 inches by 8 3/10 inches which allows it to fit beneath most seats and in many glove boxes and consoles. It has a foam lining the top and the bottom, with the top foam being glued in place. The bottom layer of foam is loose to allow for easier permanent mounting, if you so choose. This gun safe is constructed of 18 gauge steel and is great for those who need to lock up their everyday carry gun. Its slim design allows it to travel easy as it fits nicely in a bag, briefcase, a desk drawer, and can even be placed beneath the seat of your car. It also meets TSA firearm guidelines and so it can be used when travelling by plane. That convenience paired with top-notch security is what makes this the best gun safe for car use. 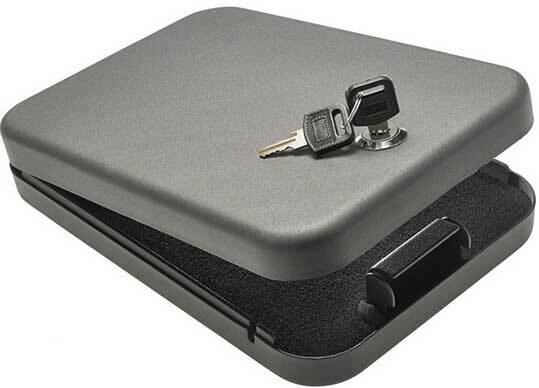 This gun safe has an easy to use key lock and comes with two keys. It features a half inch of memory foam on the top and bottom of the interior of the safe, ensuring that your handgun won't bounce around and be potentially damaged. It comes with a 1500 pound test security cable for simple and secure mounting in your car and is backed by a five year warranty against fire or burglary. This gun safe has external measurements of 9.5 inches by 6.5 inches by 1.75 inches. That provides enough space internally to securely hold a 1911 style handgun, often with room for an extra magazine or two, depending on your exact type of gun. See price and more of the NanoVault NV200... Click here. This gets our vote for one of the best car gun safes for a number of reasons. It's made of heavy duty 14 gauge steel and can be mounted vertically, horizontally, or with a steel security cable (not included.) This gives you more options when it comes to using this gun safe in your car, as you could mount it in the trunk, along the center council, under your seat, or anywhere there is enough clearance for the door to open and you to fit your hand within. This gun safe also has a unique push button lock that does not require batteries. There are five buttons, allowing for over a thousand different key codes to choose from. This lock will not open unless the numbers are entered in the right sequence, unlike some push button locks that will unlock merely if the right numbers are pressed, regardless of sequence. It takes about three seconds to enter the code and open this gun safe. This gun safe has internal measurements of 9 inches long by 2 inches deep by 7 inches wide. This is enough room to hold most 1911 style handguns. 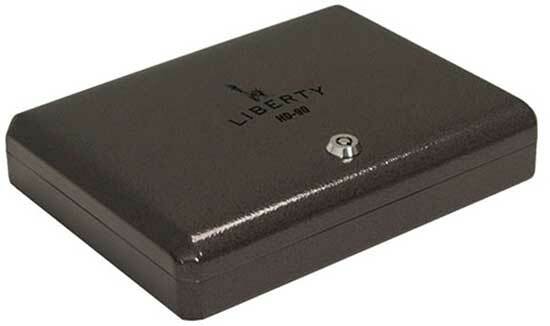 This gun safe is made of heavy duty 18 gauge steel and is a similar, though more affordable option, than one of the other gun safes in this list. It has a slim design that allows you to easily conceal it under the seat of your car or possibly in the glove compartment (depending upon your vehicle) making it one of the best gun safes for car use. It features a key lock, and comes with two keys. The interior top and bottom are both lined with 1/2 inch of memory foam to prevent rattling and potential damage to your gun. 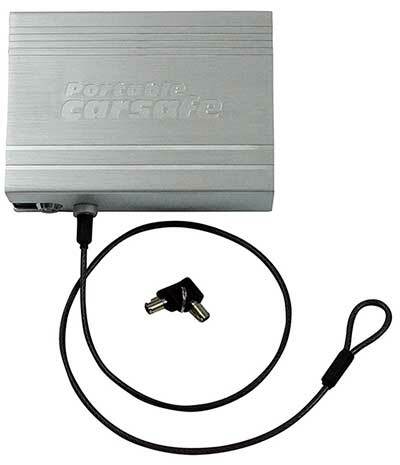 This gun safe comes with a security cable to allow for easier mounting in your car to prevent smash and grabs. This safe also meets the TSA airline firearm guidelines, making this a great choice of safe for your everyday carry if you should travel. It measures 9.5 inches by 6.5 inches by 1.75 inches externally; internally it loses about 1/2 of an inch in length and 1/4 of an inch in width. This gun safe will comfortably hold a full size pistol, such as a PPQ with two magazines or a Glock 21. See more of this Snapsafe Gun Safe... Click here. This gun safe was designed specifically for car use and features a unique design that requires the use of the security cable to secure the safe within your car. This is a key lock safe, coming with two tubular keys. The outside of the case is constructed of 2mm thick steel while the inside drawer of the safe is made of 12mm thick steel. It has a soft foam padding on the inside that will prevent scratching to your gun but will not prevent rattling. 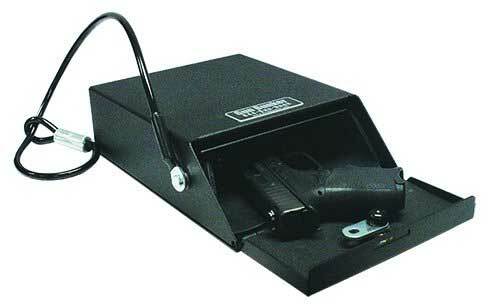 This gun safe measures 6 inches by 8.5 inches by 3 inches and comes with a 3 foot long steel security cable. 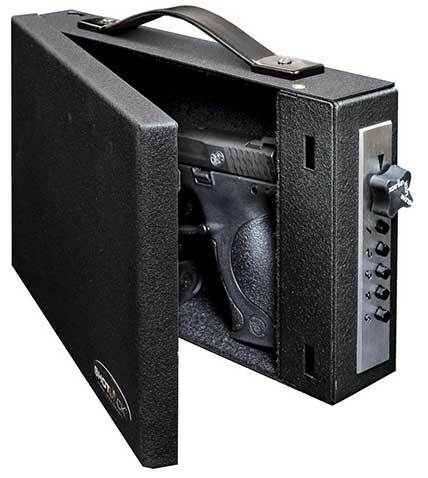 The way this gun safe works is that when you insert and turn the key, the security cable detaches from the inside drawer of the safe, allowing you to slide the drawer out from within the outer case. This gives you access to your handgun or valuables. This is a very affordable gun safe designed for use in the car and to be tucked beneath your seat. What Is The Best Car Gun Safe? The best car gun safe doesn't need to be complicated to provide you with the security you need to lock up your concealed carry when traveling or entering buildings where guns aren't allowed. Each of these gun safes for cars will provide you with that necessary peace of mind that comes knowing that your gun is locked safely within your vehicle. Our number one choice is the Original Pistol Safe by Fort Knox. Of all of the car gun safes that we looked at, this was the only gun safe made with steel thicker than 14-gauge. It’s also the least susceptible to smack and grab as it must be permanently mounted for utmost security. Heavy interior foam will keep your gun from bouncing around, but the price tag and larger size may leave some people looking for a smaller and more affordable option.